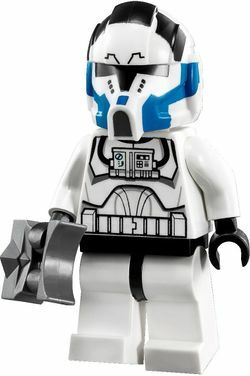 The 501st Clone Pilot is a minifigure released in 2013. Clone Troopers from the 501st Legion served under the command of Jedi General Anakin Skywalker. These troopers had commonly had blue markings on their armour. Clone Pilots from the 501st were seen piloting Z-95 Headhunters during the Clone Wars. Facts about "501st Clone Pilot"
This page was last edited on 12 January 2016, at 20:50.